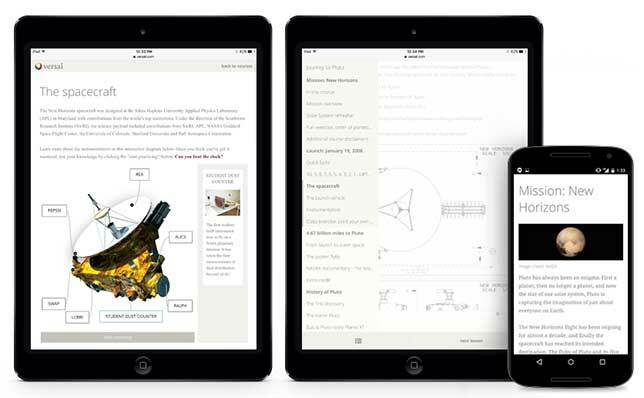 Ed tech company Versal has added mobile functionality to its online course authoring tool, allowing users of Android and iOS devices to access courses and via a new mobile player. With the new player, the functionality of the mobile versions mirrors that of the desktop counterpart, including the ability to use interactive gadgets. According to Versal: "Too many campuses still lack dedicated computers for each class, and teachers can't always count on a student to have a computer at home. But when we talk to teachers, one consistent theme we hear is this: most students have smartphones and/or tablets, and this 'app generation' responds very well to interactive online learning experiences." Embed courses in external sites. Paid editions allow for the creation of private courses, student progress tracking, LMS integration, single sign-on and other features. Faculty training and e-mail support are also available. More details can be found on Versal's site.